In some Africa RISING sites, tree lucerne is a key supplementary feed for ruminant animals particularly in dry seasons when other feeds are in short supply. The plant is an important source of protein for animal fattening and milk production and can be mixed with other livestock feeds including those based on crop residues or hay. In Ethiopia, most farmers do not fully know the importance of the plant or how to best use it as livestock feed and a clear understanding of how to manage it is needed. The project has tackled the awareness challenge in various ways – including through training and demonstration. Read a 2016 poster on fodder and fertilizer trees action research in Africa RISING sites. Read a 2016 report with guidelines on the utilization of cultivated oat-vetch and tree lucerne fodder in the Africa RISING sites of the Ethiopian highlands. 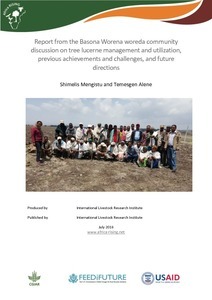 Read a 2014 brief on integrating tree lucerne into crop-livestock farming systems of the Ethiopian highlands for multiple products and services.